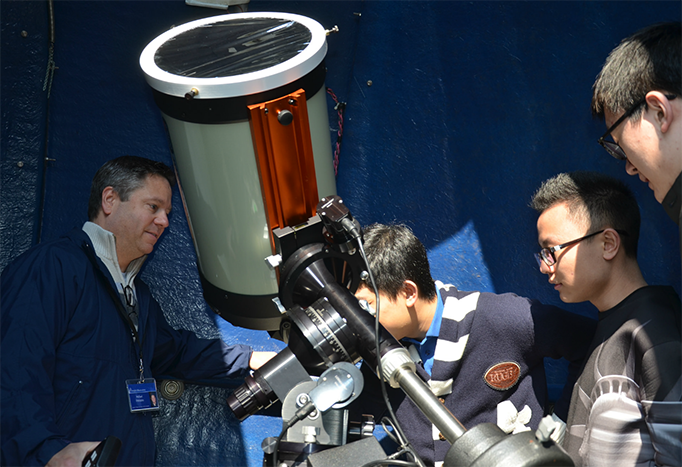 On Monday, May 9, 2016, close to 100 students from grades 7 thru 12 walked into the Kohout-Dingley Observatory located on the Sacred Heart High School campus to safely view the rare transit of the planet Mercury crossing the disk of the Sun. This was the first use of the new Baader solar filter manufactured by AstroZap recently purchased specifically for the event. The session, in partnership with staff of Insight Observatory, hosted entire classes throughout the course of the school day as well as small groups of students visiting during their lunch session. All observers were treated not only to the Mercury transit event but were able to observe groups of sunspots as well. Sacred Heart Students Observing the Mercury Transit - Photo by Joe Masi. 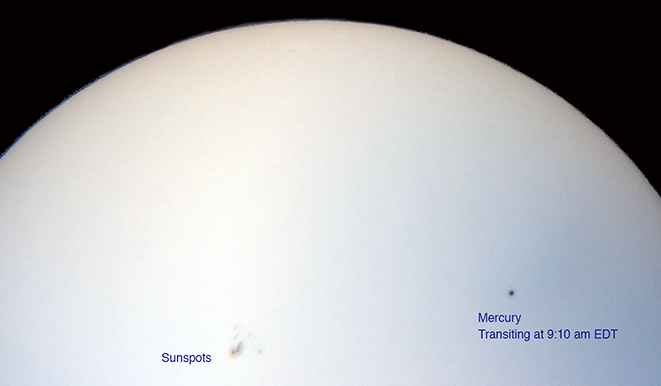 The early morning hours of May, 9th brought a potential promise of clear observing conditions for the transit. However, just as I was leaving for the observatory to set up for the day, clouds started quickly rolling in. I checked in with the transit's live coverage feed from Sky and Telescope Magazine and J. Kelly Beatty, one of the publication's Cheif Editors, was reporting the same weather conditions from Cambridge, Massachusetts. Once I arrived at the school's campus around 8:10 am located in Kingston, Massachusetts, I noticed the clouds were starting break up and scatter a bit. Joe Masi, a science teacher at the school, assisted me with opening the facility that houses the 11" Celestron Schmidt-Cassegrain Telescope. As the sky proceeded to clear up, we locked the solar filter onto place on the telescope and proceeded to slew the telescope towards the Sun. Remember, NEVER look directly at the Sun find it. As I focused the telescope I immediately detected a defined sharp black dot on the Sun's disk along with a few small groupings of sunspots. Mr. Masi wanted to get a quick peek before his 9:00 am class started. He quickly spotted the tiny planet as well. A little after 9:00 am, Mr. Masi returned to the observatory with his first class. As the students in groups of 2 or 3 took turns viewing the Mercury transit upstairs at the telescope, the rest of the class below learned about the event taking place with a display set up by Insight Observatory on the first floor. The science teachers were discussing what was actually transpiring as well by using the display as an aide. While Mr. Masi's first class was enjoying the event, he suggested that the students image the transit on their smartphones. Some of the students attempted this throughout the day (as I did myself). However, it was very painstaking trying to hold the device steady enough to get an image in decent focus. 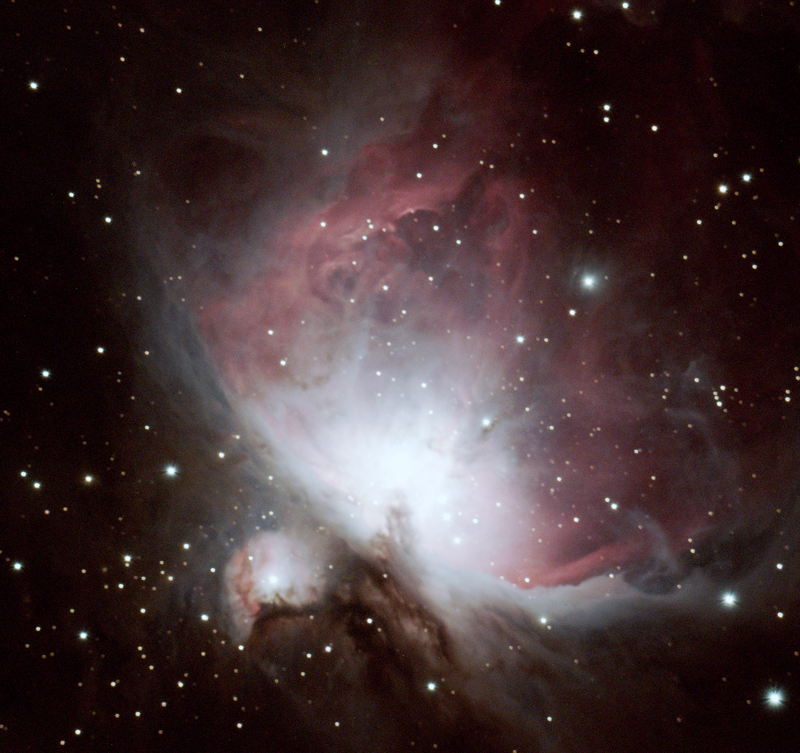 A student from the first class, Nolan D., had the most successful image of the day. The morning classes that visited the observatory were treated to excellent views of the transit as the sky completely cleared up. However, the students that stopped by during their lunch period were challenged by fast-moving clouds. As they patiently waited, they were able to get a quick glimpse. Mercury Transit at 9:15 am EDT - Image by Nolan D.
After the last class left around 2:10 pm, I sat in the observing chair at the telescope and took in the last part of this rare event. I watched the silhouette of the planet slowly disappear at the sun's limb exactly at 2:41 pm EDT. It was a great astronomy education experience and pleasure in sharing the transit of Mercury with the Sacred Heart students. Some of them are already looking forward to the next one in November of 2019. Special thanks to Frank Lopez of the Stellarvision Astronomy and Science Shop located in Tucson, Arizona for his prompt delivery of the AstroZap Solar Filter allowing us to observe this special event. Hey Harry, how they hangiin'? Nice post, Mike. I watched the transit from the Werner Schmidt Obs. at D-Y, in the 16-inch and several smaller scopes. Thanks, Jim! 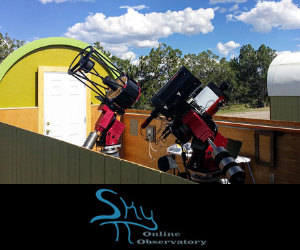 I'm glad you were able to observe the transit at Werner Schmidt Observatory!